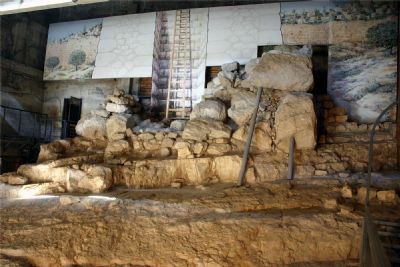 In the late 1990’s, Ronny Reich and Eli Shukron were excavating the area in Jerusalem near the Gihon Spring in preparation for the construction of a visitors’ center. Much to their surprise, they uncovered some of the remains of two towers and a portion of a large pool that had been guarded by these towers. The tower near the pool is called the “Pool Tower.” It is estimated that it measured 45 by 55 ft. [13.7 x 16.8 m.] and that its walls were more than 12 ft. [3.7 m.] thick! It is believed that these towers and the associated pool were built during the Middle Bronze II Period (ca. 1800 B.C.) and that they continued to be used for over 1,000 years. Indeed it is possible that Joab and his men gained access to “Jerusalem/Jebus” via this water system (2 Sam 5:6–10; 1 Chron 11:4–9). For a popular presentation of their finds, see Reich, Ronny, and Shukron, Eli. "Light at the End of the Tunnel: Warren's Shaft Theory of David's Conquests Shattered." Biblical Archaeology Review, vol. 25, no. 1 (January/February, 1999):22–33, 72.